Republican candidate Herman Cain denied sending 100 Godfather’s Pizzas to Bolingbrook’s Clow UFO Base in 1996. His address to the Orb concluded a day where he fended off sexual harassment charges, and accusations of campaign finance rules violations. 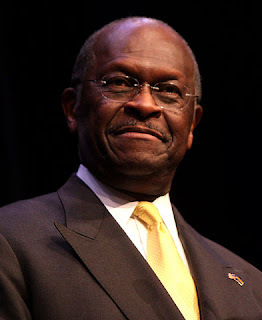 Cain, however, remained in high spirits in the face of the latest allegations. After accepting a campaign donation, from the Orb, a reporter asked Cain again about the allegations. The reporter countered that its sources said that they were acting under specific order from Cain, and that Godfather’s corporate office paid for the pizzas. Cain then continued, “You people are coming at me with gotcha questions. We’ll I’m ready. I’m ready if you ask me who the leader of Mars is. I’ll tell you that I don’t care. Just like I don’t care who the leader of the Soviet Union is and who the leader of Afghanistan is. It’s not important. I only care about the big issues, like getting the Orb’s 999 plan implemented on Earth. They’ve invested too much time, and planted too many implants inside me. They don’t want me to worry about trivial things. They want me to focus on the vision. When asked if Cain had just admitted he was a pawn of the Sphere, Cain sang, “Stairway to Pizza” and walked off stage. The prince of the Orb, then denied that Cain was a tool of the Orb. “We respect the man and his universal support for free enterprise. We also respect his courage to run an ad featuring a man smoking. That tells us that he will reopen the US market to interstellar tobacco imports. We’re going to make a killing with Cain as president.